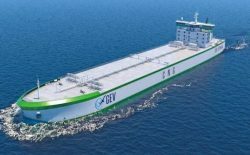 Western Australia-based Global Energy Ventures Ltd (GEV), a developer of global integrated compressed natural gas (CNG) projects, has received from the American Bureau of Shipping (ABS) approval for construction of the CNG 200 Optimum ship. The company says the dual-fuel vessel will achieve greater than 90% CNG-powered propulsion. The ABS approval of the CNG-O-200 design follows the completion in December 2018 of an extensive work program including prototype testing of the Optimum system, review and verification of the design, review of the safety studies and a Hazard and Operability Analysis (HAZOP). GEV will continue to work with ABS throughout the final engineering and construction phases. Chairman & CEO Maurice Brand said “the timely review and granting of the letter of approval by ABS for the CNG 200 Optimum ship is the culmination of three years of focused dedication and effort by the GEV Canada team. This is a major milestone for GEV as without this approval, GEV would be unable to move forward with the construction of its CNG Optimum ship and achieve a Final Investment Decision (FID) for its first CNG project. Delivering FID is the Company’s main objective in 2019. GEV has appointed Hong Kong-based SeaQuest Marine Project Management Ltd to assist in finalizing the technical specification and to perform the plan approval: during the first quarter of 2019, the team will finalize all technical and commercial discussions and the project schedule based on a firm 4 CNG 200 Optimum ships order with options for a further 2+2 ships. The Optimum ship design maximizes the amount of CNG that can be stored within the hull of a ship.